The Editor's Guild Magazine recently wrote a great article recapping the debut of EditFest Shortcuts, an event we co-produced with American Cinema Editors this January 20, 2011. To read the article please click here. Tired of rotoscoping with masks? Introducing Roto Brush, After Effects' new time-saving tool that creates a matte to separate foreground from background. In this demo featuring our Certified Adobe instructor Justin Madden, we will take you step by step through the Roto Brush workflow, such as creating a base frame, tweaking the propagation parameters, locking segmentation boundary, and refining the matte. Thursday February 3, 2011 at 3pm - 5pm. Register here. This is a free event that will be held at B & H Photo Video and Pro Audio located at 420 9th Ave, NY New York 10001. Justin Madden is a freelance film editor and video artist artist who has worked in New York for over 11 years. After processing and printing motion picture film at Bono Film Labs in Arlington, VA, Justin moved to New York City in the beginning of 2000. He began teaching Editing at the New York Film Academy, eventually serving as Post Production Department Chair and supervising the edit lab. In 2007, he worked with Giant Studios on set of I Am Legend, shooting motion capture with the VFX department. Since then, Justin has shot, edited and created motion graphics for corporate and educational promos, music videos, and long and short form documentaries. Justin is an Adobe Certified Expert and teaches all levels of After Effects. Mewshop's Latest DSLR Workshop Is Another Success! New Dates In March Announced! The video above is from our latest sold out DSLR Workshop that ran January 21 -23, 2011. Our next DSLR Intensive is from March 25 - 27, 2011. For more information on our upcoming workshop please click here. Thursday - January 27, 2011 - Avid Pro Tools 9 Demo at B&H Photo! Come see a demo of the new Avid Pro Tools 9 with certified Pro Tools trainer Terron Darby. With the new Pro Tools 9 you can work with your favorite Avid or third-party audio interface — or standalone — and with Avid Artist and Pro Series (formerly Euphonix) controllers. We'll take a look at Automatic Delay Compensation, OMF/AAF import and export and more. 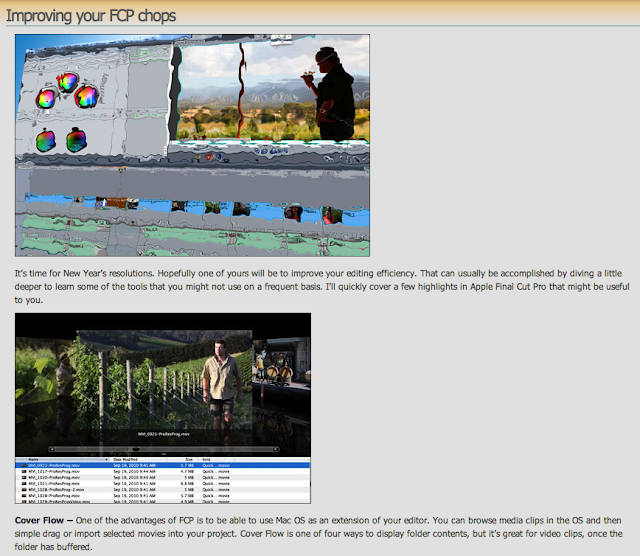 Finally we'll talk about boosting your power with Complete Production Toolkit 2. This one hour demo will be followed by a Q&A session. Thursday January 27, 2011 at 11am - 1pm. Register Here. Terron Darby, working in the capacities of mix/recording engineer and producer/remixer, has lent his production prowess to a host of artists and labels. Some of his credits include London-based artist Natalie Williams “This Girl” -Lazybatusu Remix- out on Eastside Records and Black Opium featuring Fabio Morgera on trumpet (of Grammy-nominated band Groove Collective).His original productions/Remixes out on Sofitone Recordings, Chillin Records, Aqua-Booty, and Next Dimension. 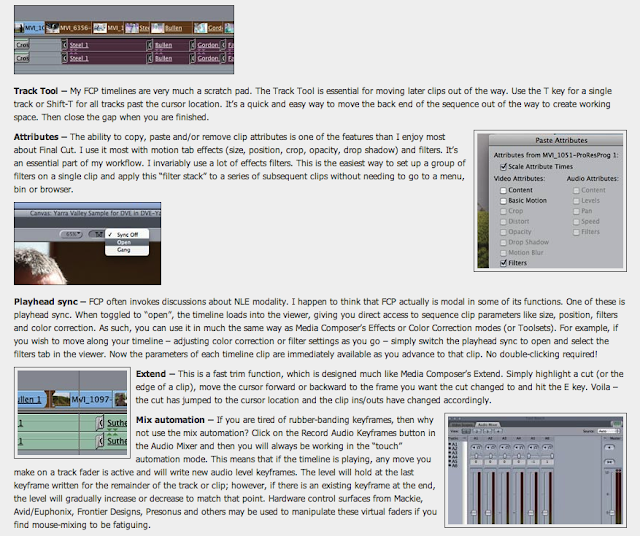 He is currently freelancing, engineering and is an expert level Avid instructor teaching Pro Tools Certification Classes now offered at Manhattan Edit Workshop. Editor Sabrina Plisco discusses how editors must shift gears and adapt to reactions from preview audiences, as she demonstrates with "Beverly Hills Chihuahua" at EditFest NY 2010. For more information go to editfestny.com. EditFest Shortcuts Featuring Editor Craig McKay - Early Bird Price Ends Today! In 2008, American Cinema Editors (ACE) launched EditFest LA - a unique event, dedicated to the art of film editing . This weekend series of screenings, talks, Q&A sessions and parties proved an entertaining way to shine a spotlight on an amazing and often misunderstood art. A year later, Manhattan Edit Workshop offered to co-produce EditFest NY, the east coast extension of EditFest and the blockbuster editing event of the Summer! Both shows have become wildly popular weekends for both fledgeling and veteran editors as well as film-lovers and enthusiasts. Now in it's third year, EditFest is growing again - with EditFest Short Cuts! These "mini EditFests" are in-depth talks with a single editor, aimed at taking a deeper look into one artist's body of work. For our first EditFest Short Cuts we decided to reach for the stars. We got two of them! On January 20th, 2011 at 7PM, at New York's Helen Mills Theater, please join us for an intimate discussion of the editing process through the work of film editor Craig McKay, moderated by distinguished author/editorBobbi O'Steen. EditFest Short Cuts is produced by ACE and Manhattan Edit Workshop and presented by The Moving Pictures Collective NYC. Discount Price - $15 - For students and members of the following groups (please enter the promotional codes below in the comments box on our registration page to receive discount). Please choose theEditFest Shortcuts Event - Craig McKay $35 on the "Special Workshops" drop down tab on theregistration page. You will NOT be charged $35, the discount price will be reflected after registering. Digital Cinema and DSLR Filmmaking Demo at B&H Photo - January 10, 2011! Join Josh Apter of Manhattan Edit Workshop and Jem Schofield of theC47.com to learn about how video capable DSLRs and the new crop of large sensor, interchangeable lens based video cameras like the Panasonic AG-AF100 are changing the way we do production. This will be an in-depth workshop on shooting techniques, editing workflows and distribution options when working with these various camera systems. The event will also include a live demo of lighting, audio and shooting techniques for video podcasts. 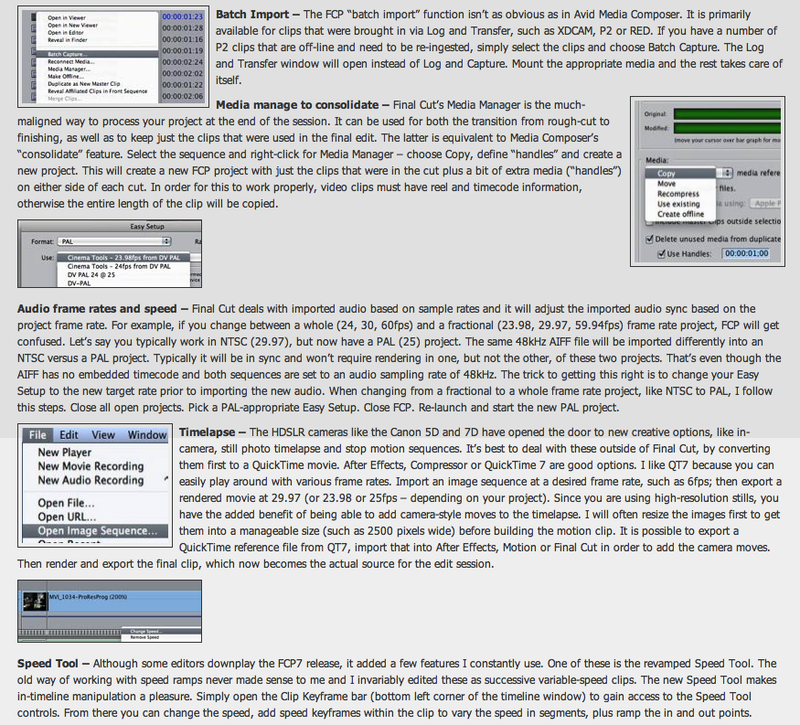 Post production topics will include double-system sound and working with both Final Cut Pro and Adobe Premiere Pro. Monday January 10, 2011 at 3pm - 5pm. Event has been booked to full capacity. Space may become available due to cancellations or no-shows on the day of the event, in which we will be seating on a first come first basis. After graduating from the University of Pennsylvania, Josh Apter Attended NYU's Graduate Film Program, where his film, The 53rd Calypso, was honored with the Martin Scorsese Award for achievement in directing. The film, which stars Edward Norton, received numerous awards for directing, editing, and cinematography at film festivals across the country. For his first feature, Kaaterskill Falls, Josh was nominated for two Independent Spirit Awards - the John Cassavetes Award and Best Debut Performance. Kaaterskill Falls was also awarded the Critic's Jury Prize at the IFP/West Los Angeles film Festival. It screened on the Sundance Channel, and is available wherever DVD are sold, rented or streamed. Josh has served as editor on over eight feature films including The Holy Land (winner Slamdance FF/Cavu Pictures Distributor), Kaaterskill Falls and Barbecue is a Noun (Audience Award for best Documentary at the Rome International Film Festival and the River Run Film Festival). 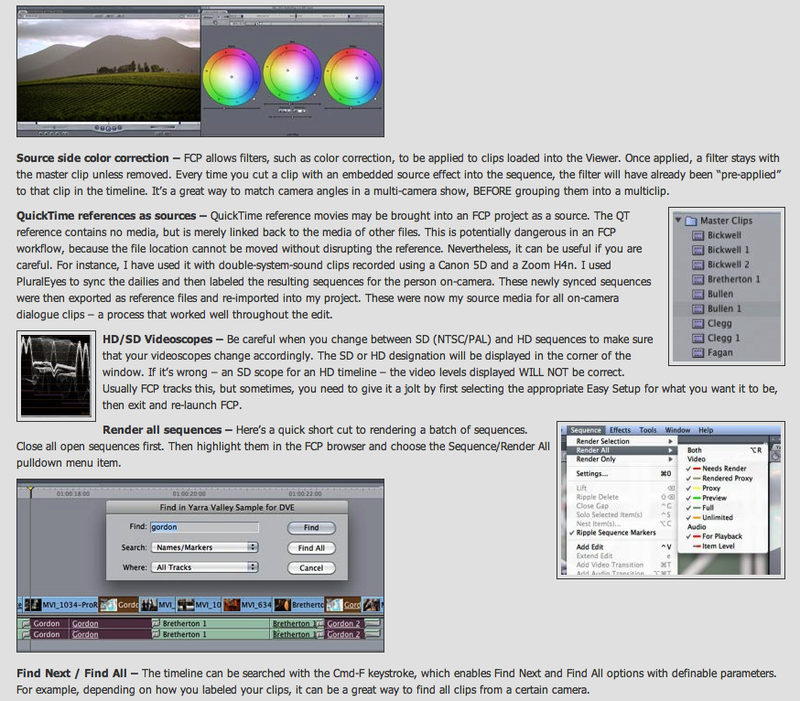 In 2002, Josh founded Manhattan Edit Workshop, an Apple, Avid and Adobe Authorized training center offering a variety of classes in the art and technique of film editing. Josh is always developing, producing, directing and editing projects of all shapes and sizes. He is completing post-production on his second feature film, a love story about a small-time pot dealer titled, Dealing, and a documentary following five people as they traveled across the country to the inauguration of Barack Obama titled, Out of Many. Jem Schofield is a producer, creative director and author who consults on and teaches production and post-production solutions throughout the country. His company, Buttons Productions, produces commercial video, print, motion graphics and DVD based projects. He is also the founder of theC47 and theC47.com, an online and offline resource for production based training, information and services. Clients include Apple, Inc., Verizon, The New York Times, Vision Research, Manhattan Records, Abel Cine Tech, BlogTalkRadio and The Cooper Union. Visit www.theC47.com for more information about Jem and his whereabouts. 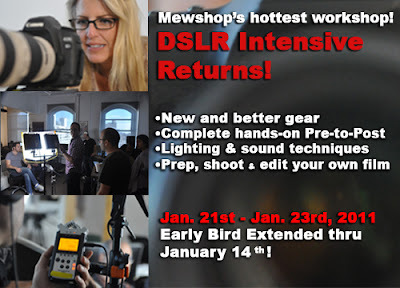 DSLR Intensive Returns January 21st! Early Bird Extended until January 14th! Due to the holiday season, and requests from registrars, we are extending the early bird pricing for the workshop until Friday, January 14th. We are also introducing a new option. If you bring your own laptop with either the full version of Final Cut Pro 7 (part of Final Cut Studio 3), or the full version of Adobe Premiere Pro CS5, you can save $100 off of the early bird or regular pricing of the workshop. To read more about this amazing class please click here.